The following article was written by Chuck Link. 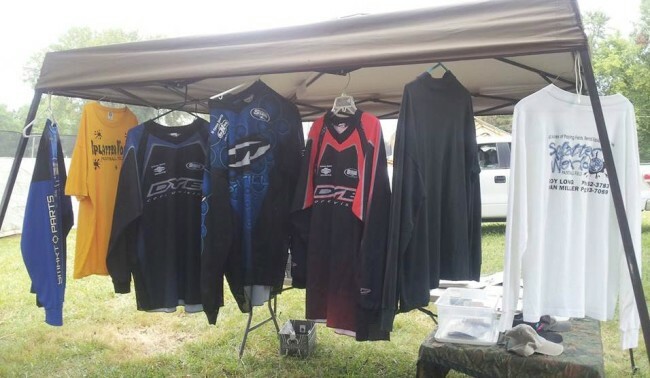 Chuck has been a great source of information over the past year or two on team memorabilia and general paintball history from the Tennessee, Kentucky and Mid South area. 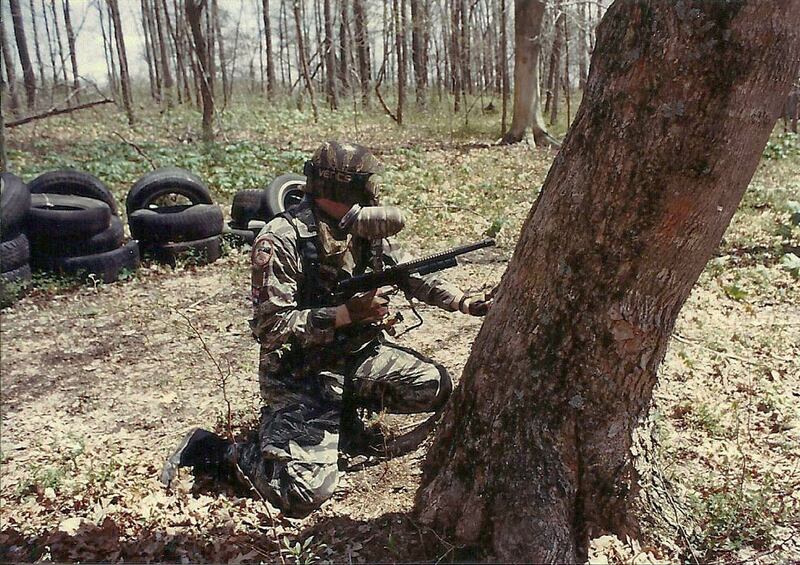 Chuck Link shooting a Minimag with a Paintball Mania 122 ci tank. Chuck writes, that yes, the tank was “HUGE!…..but I didn’t run out of air.” Photo taken during a game at the 1999 Masters in Nashville. He played and competed regularly from 1988 till 2002 on TN Grim Reapers, Paladin, The Music City Hooters, Slick Fox Raiders and Team Lightning Strike. A couple months back Link sent me this write up along with tons of photos which I’ve added along with memorabilia and magazine scans. TN Grim Reapers (and a few others at Games Unlimited near Gallatin, TN c. 1987-1988. 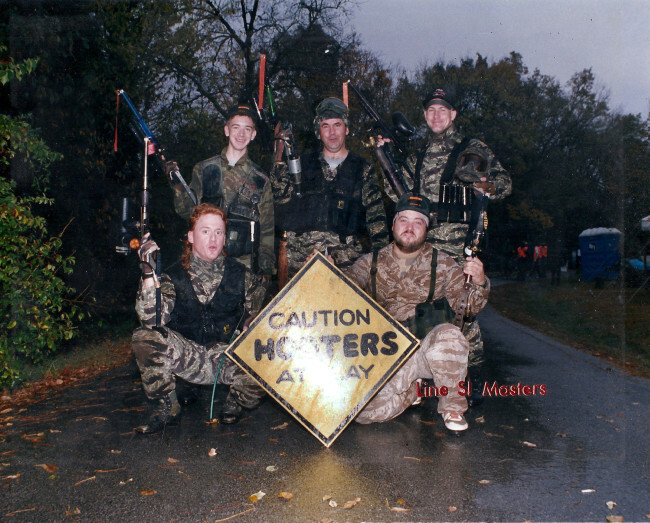 Pre-1988 – TN Grim Reapers formed by a few former members of the TN Ridgerunners. 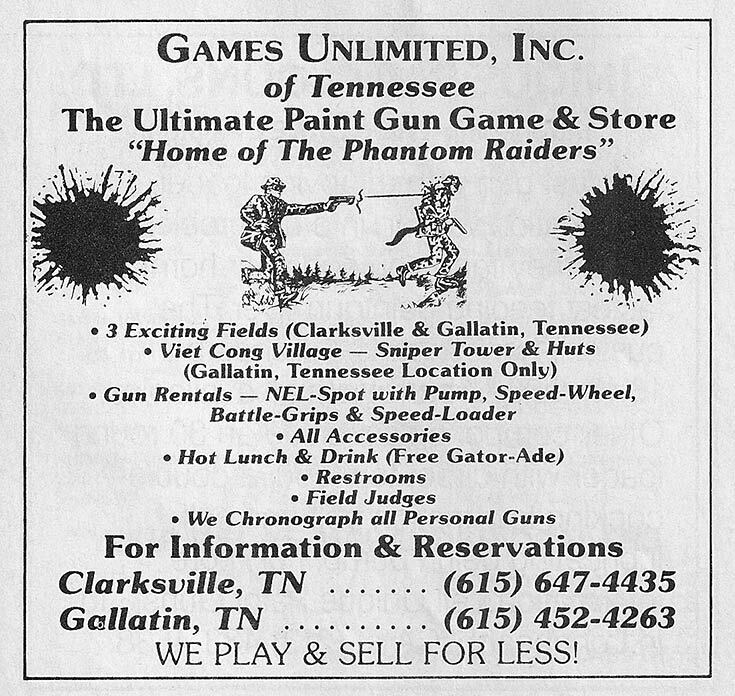 Early photo above is of a core group of TN Grim Reapers and a few other players at Gene Watkins’ field, Games Unlimited near Gallatin, TN (just outside of Nashville). This was before Jack Kirby and I joined the team. However, Al Winfree can be seen in this photo, bottom row, second from right. Guy on the right next to Al is Gene, the Games Unlimited field owner. Back row, far left is Tad Taylor, owner of Slick Fox Adventure Games (Scottsville, KY) who would later help form the MSPA and PRA (Professional Refferees Association). Photo is probably from some time in 1987. Games Unlimited Ad from the September 1989 issue of Paintcheck magazine. 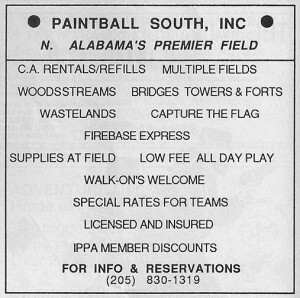 The scan above appeared in the September 1989 issue of Paintcheck, advertising Games Unlimited’s two locations. 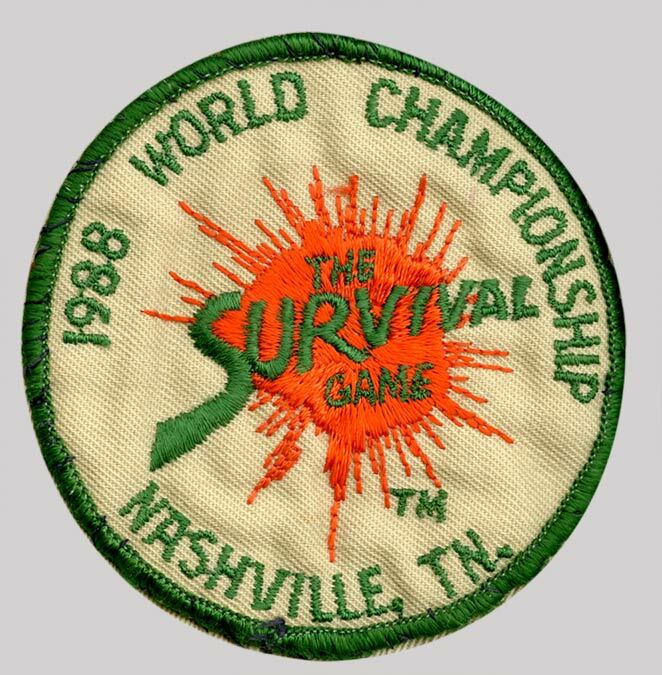 1988 National Survival Games Championship Patch from Nashville, TN event. Fall 1988 – Al Winfree, Jack Kirby, Jerry Edwards, Scott Winfree, and Chuck Link make up a 5 man squad (one of about 4 full 5 man squads) on the 15 man team, TN Grim Reapers. 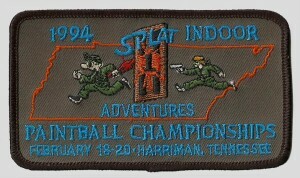 TN Grim Reapers play in the 1988 NSG World Survival Game Championships in Nashville, TN. 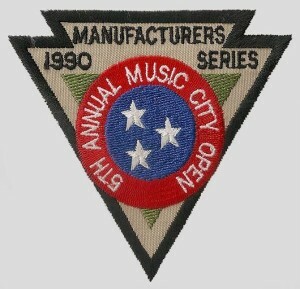 Music City Open badge patch. Not sure on year. 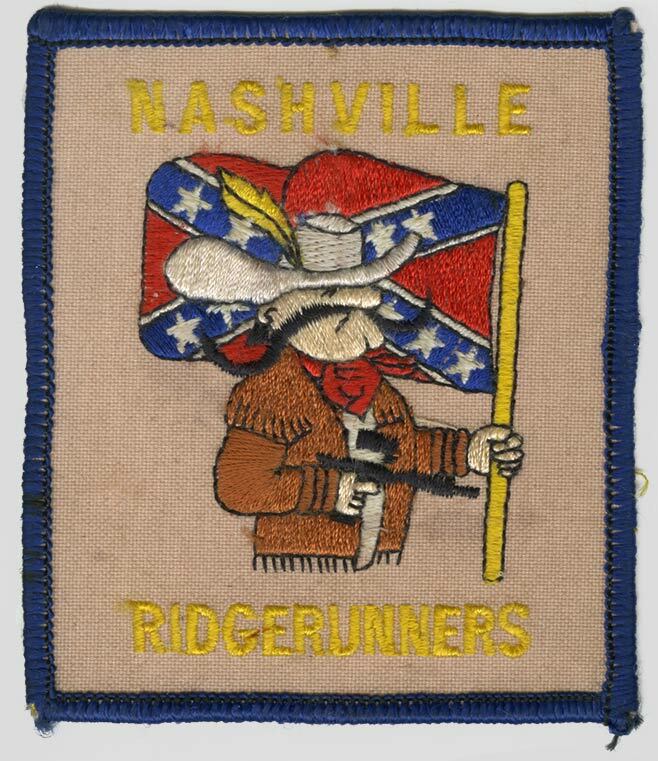 Nashville Ridgerunners patch c. late 80s? 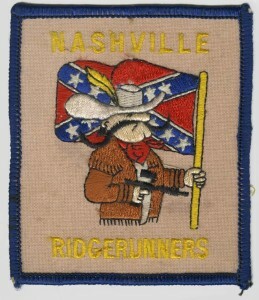 Summer 1989 – TN Grim Reapers disband….about 2 squads (8 to 10 people) join the TN/Nashville Ridgerunners to form the “Ridgerunners Black” squad. 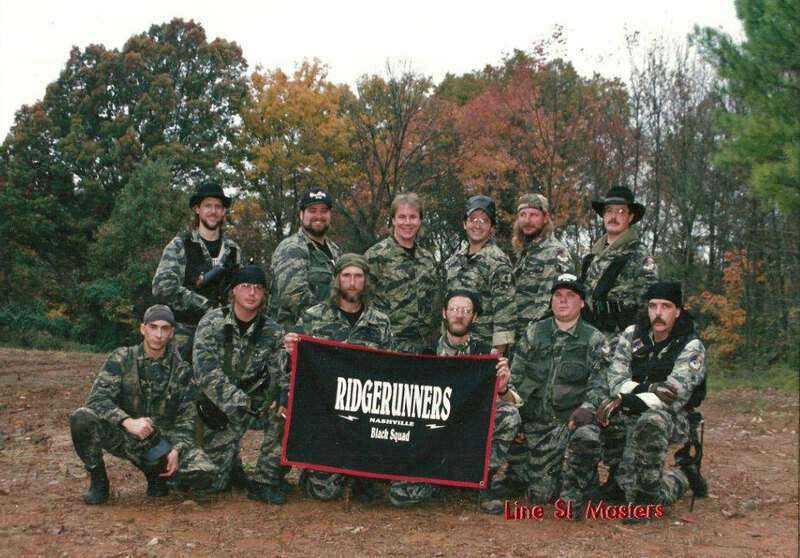 Ridgerunners Black squad, formed from the the disbanded TN Grim Reapers in mid 1989. Photo from 1989 Masters. 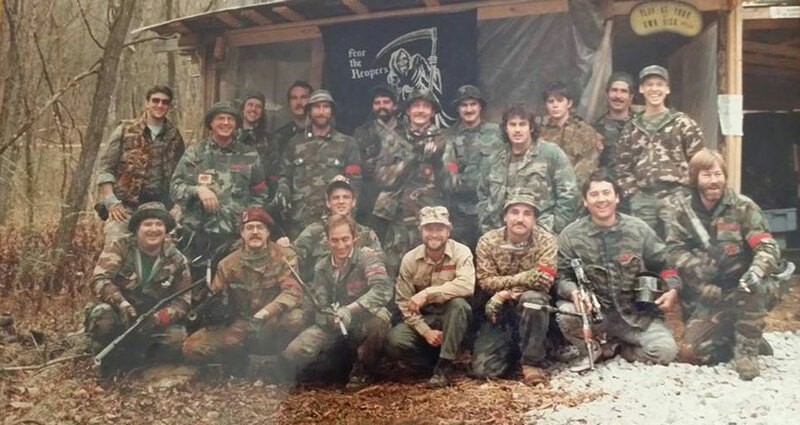 Above is a photo of the guys from TN Grim Reapers that joined TN Ridgerunners (basically went back to the Ridgerunners whom some of them played with before the Reapers). The squad of made up of Al Winfree, Jack Kirby, Scott Winfree, Jerry “Big Daddy” Edwards, and Chuck Link become a stand alone 5 man team, captained and co-captained by Al Winfree and Jack Kirby. 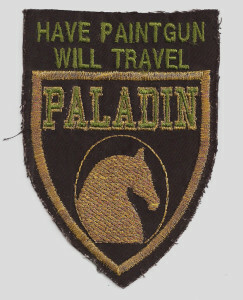 The team is called “Paladin” after the famous TV western gunslinger “Paladin” whose slogan was “Have Gun, Will Travel”. Paladin Information / Business Card, courtesy of Chuck Link. Paladin’s slogan becomes “Have Paintgun, Will Travel”. The team’s intent was to travel and play the new “5 man” format tournaments that are starting to pop up around the region (Mid South). 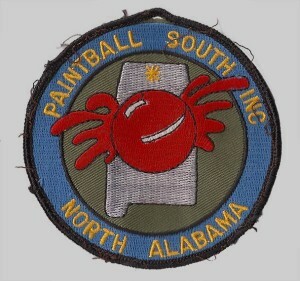 Paintball South Inc. patch from Paintball South in Northern Alabama. 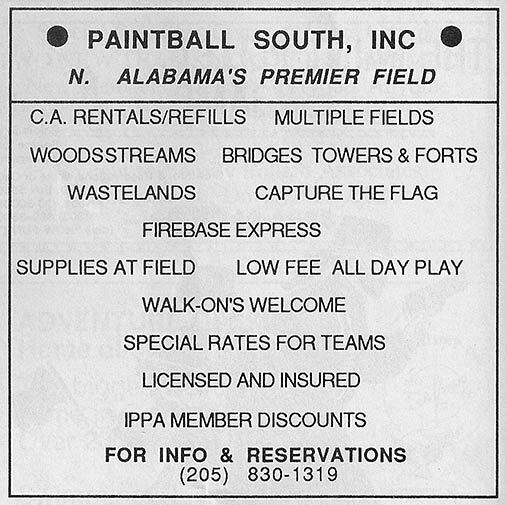 Paintball South ad from the September 1989 issue of Paintcheck. August, 1989 – Paladin travels to play our first 5 man tourney, the 1st Annual 5 man Southern Open held at Debbie and Gary Arends “Paintball South” field in Northern Alabama. 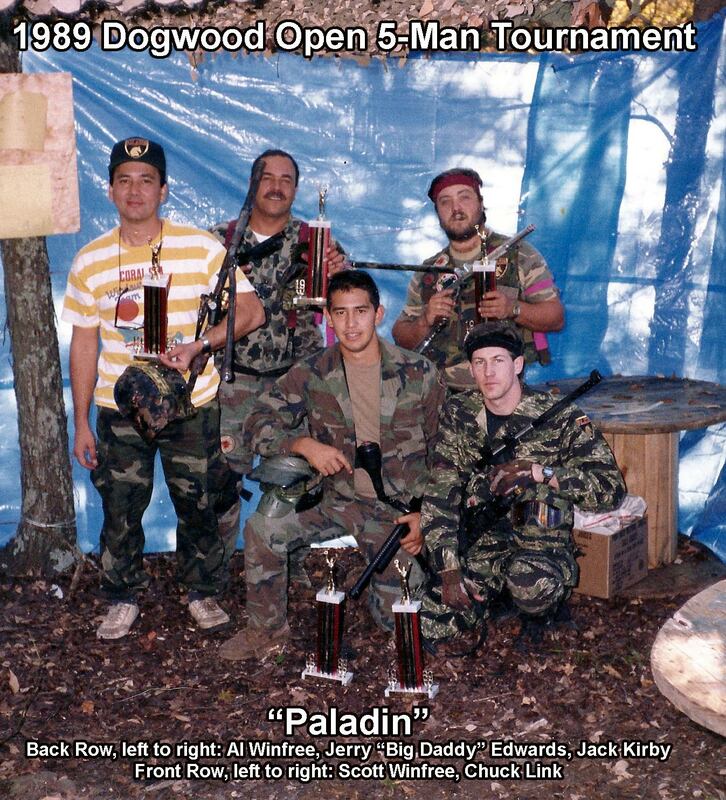 Paladin plays and wins their first 5 man tournament at the 1st Annual 5 man Southern Open held at Debbie and Gary Arends “Paintball South” field in Northern Alabama. Paladin won the tournament. This photo is after our win there. The tournament write up and another photo was in the February 1990 issue of Paintcheck Magazine (This article will be posted later). Photo from Paladin’s win at this tournament above. 1989 Dogwood Open 5-man tournament. 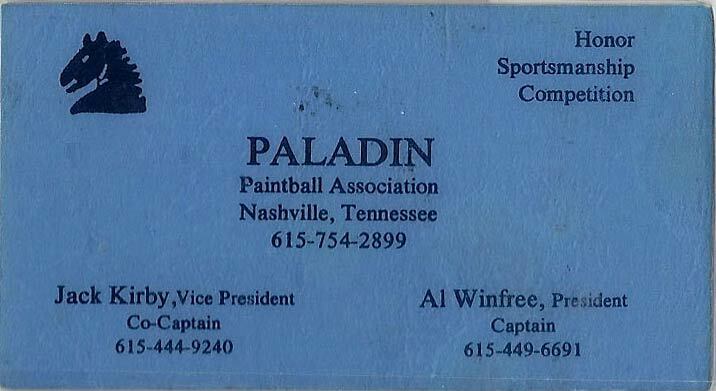 September or October of 1989 – Paladin hosts an “invitational” tournament at it’s practice field in Bowling Green, KY. The tourney is called the “Dogwood Open” after the numerous Dogwood trees found on the wooded fields there. Paladin wins this tournament as well. One game was played at a time…teams not playing in that game refereed. About 4 or 5 teams total competed if I remember correctly. Above is the photo from our win at that tourney. Paladin at the 1989 Line SI Masters. Late Fall 1989 (November maybe?) – Paladin combines with Mokokhan (also a 5 man team) of Paducah, KY and a group of Nashville Paintball regulars to compete in the 15 man division at the Line SI Masters in Nashville. The 15 man team is called “Paladin”. 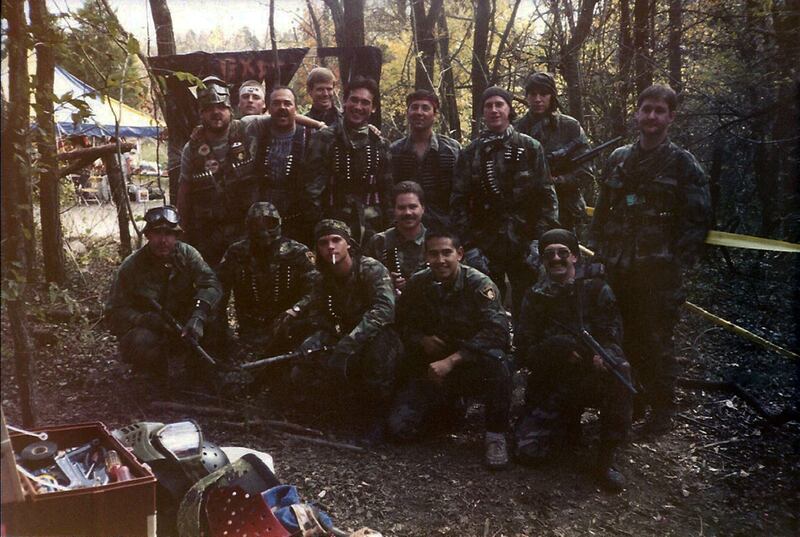 Photo of the 15 man “Paladin” team above. 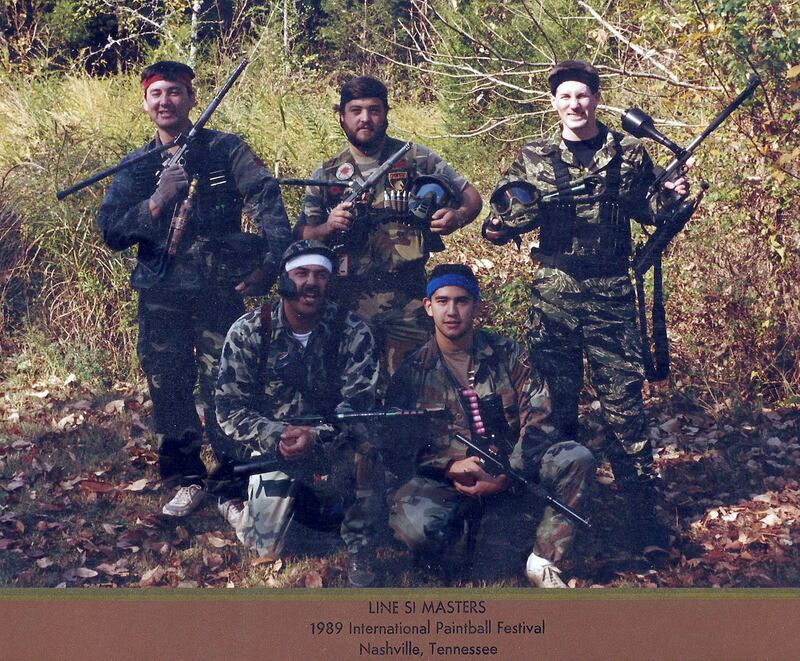 Paladin’s 5 man squad at the 1989 Line SI Masters event. Paladin also competes in the brand new 5 man division as “Paladin”, fielding their regular squad/line up of Al Winfree, Jack Kirby, Jerry Edwards, Scott Winfree, and Chuck Link. 5 man Paladin team from 1989 Line SI Masters above. 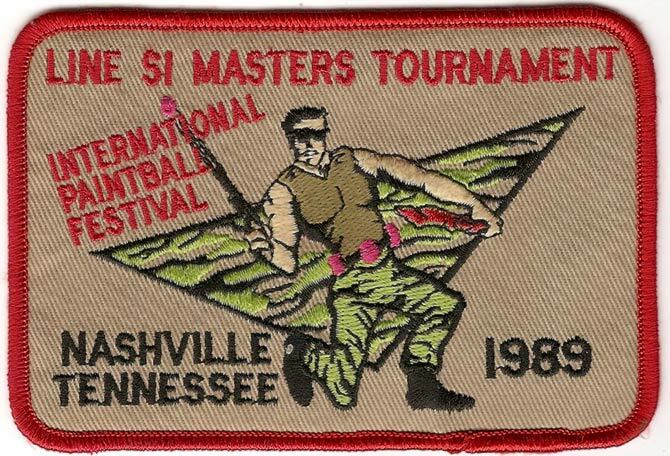 1989 Line SI Masters Tournament patch. 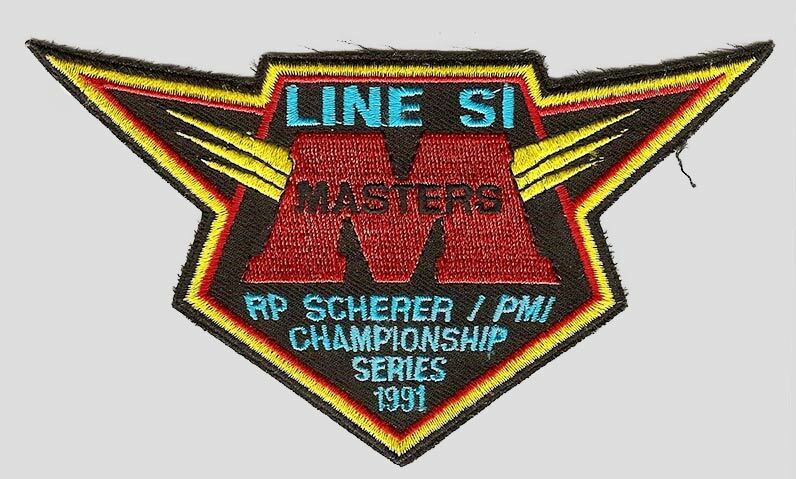 The Line SI Master was the culmination of the Lively series for the 1989 season. 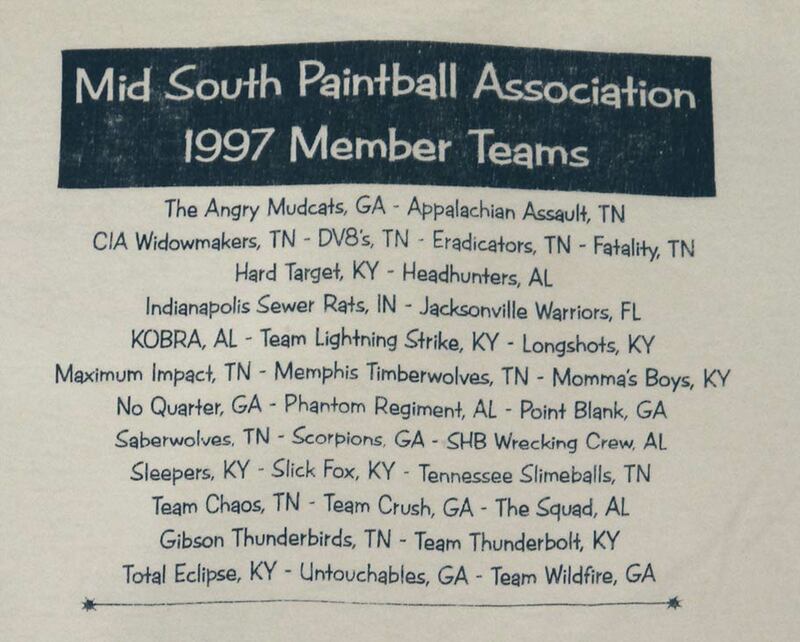 Mid South Paintball Association (MSPA) T-shirt c.1997. 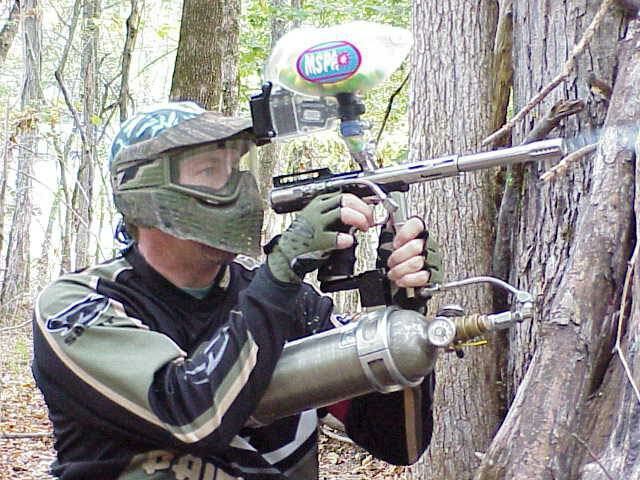 After being a part of the MSPA’s creation, Chuck would continue playing MSPA throughout his tournament paintball career. 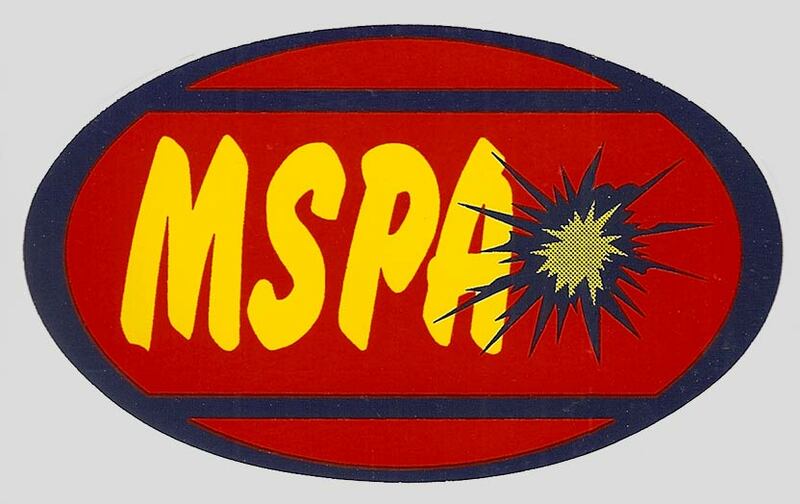 Winter 1989/Early 1990 – Al Winfree, Jack Kirby, Jerry Edwards and I all attended the first two organizational meetings held to form the MSPA (Mid South Paintball Association) in the winter of 1989/early 1990. 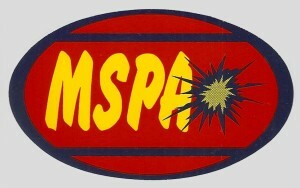 All of us would become Charter/Founding members of the MSPA. 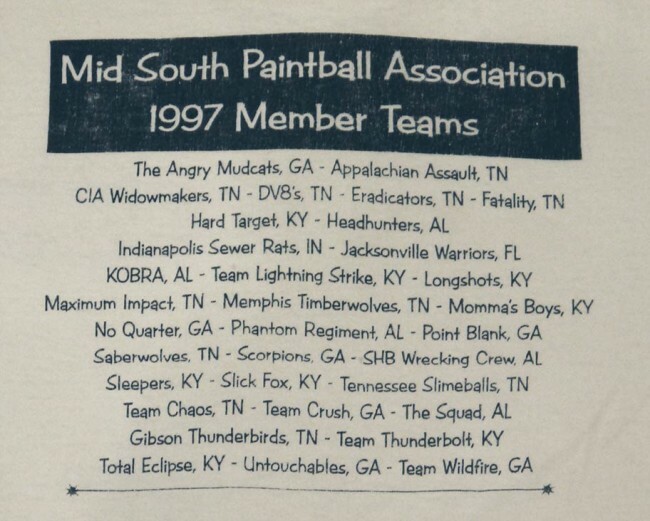 Zoom in on back of T-shirt shows 1997 teams participating in the MSPA. Paladin, Music City Hooters, Slick Fox Raiders and Team Lightning Strike all participated in the MSPA. 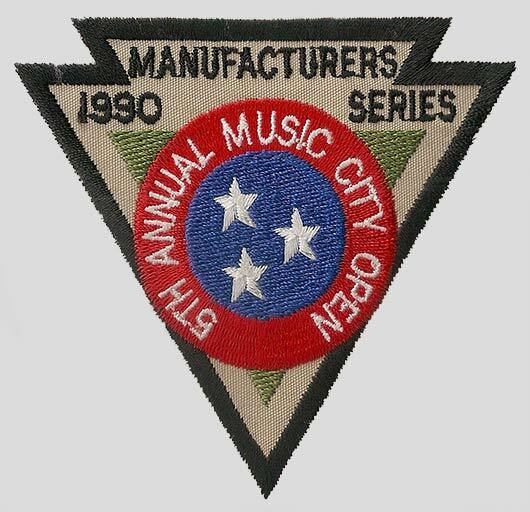 Lively Series 1990 Music City Open patch. Spring 1990 – Paladin competes in the Music City Open, Nashville, finishing 12th. 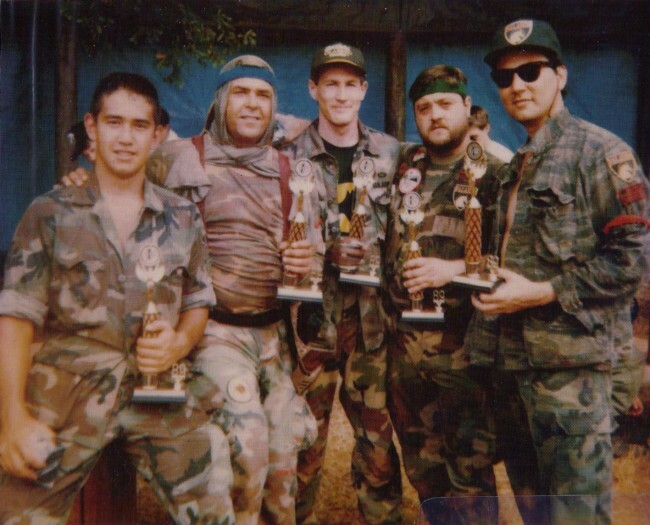 June 1990 – Paladin finishes 2nd at the Mid South Paintball Association tourney (can’t remember the location at this time). This would be the last formal tourney that the original line up/roster of Paladin would compete in. 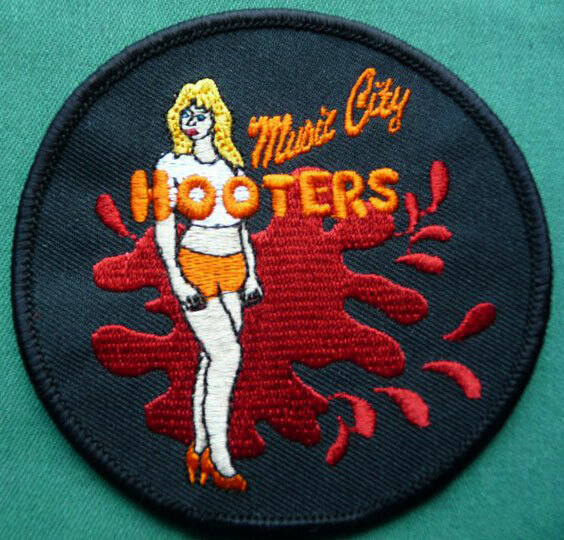 Music City Hooter’s patch. Scan courtesy Jim Lively. Summer 1990 – Paladin disbands as Al Winfree moves away due to work requirements. Jack Kirby decides to form the Music City “Night Owls” after his infamous lifestyle and his favorite place, Hooters Restaurant in Nashville. “Hooters” would later be added to the name to become the “Music City Hooters” for short after Jack set up a sponsorship deal with the restaurant around 1991. Music City Hooters c.1990 at Masters. Back row left to right: Chris Cashion, Bill Cashion, Chuck Link. Front row left to right: Ronnie Greer, Jack Kirby. Spring 1991 – Chuck Link and Ronnie Greer go on a short hiatus….new members Chris “CJ” Christians and Chris Buchheit are added. Both had been practicing with the team for a few months already, including a few times with Paladin before they became the Hooters/Night Owls. Team picks up “official” Hooters sponsorship. Tony White, friend of Ronnie Greer and also a former TN Ridgerunner, would also play some tournaments with the Hooters. 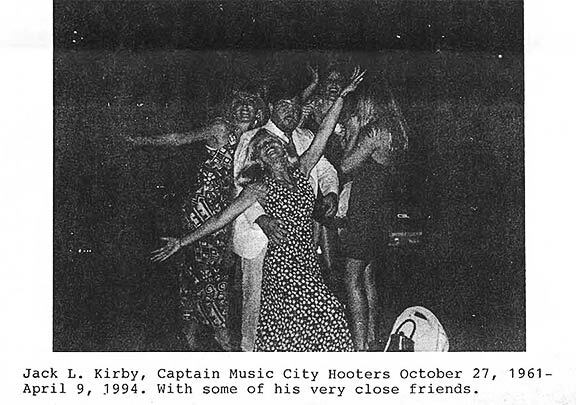 Hooters compete in the 1991 Music City Open and a full MSPA schedule. Chuck Link and Ronnie Greer would play a few more tournaments with the Hooters (mostly MSPA) over the 1991 and 1992 season. In 1991, Ken “Hollywood” Gilder published an article in Action Pursuit Games on the Music City Hooters Night Owls. To address some of the inaccurate info (honest mistake by Hollywood I’m sure) found in the October 1991 APG Magazine article. Hollywood quotes Jack Kirby saying, “In 5 man competition, we placed 13th in the Line SI Masters in 1988.” There was no Line SI Masters yet….first year for the Masters was 1989. Jack was referring not to the Hooters, but to the TN Grim Reapers 15 man team he played on. The TN Grim Reapers finished 13th in the 1988 NSG World Survival Game Championships in Nashville. Not sure how the writer got that mixed up with the Hooters except that Jack was the link between them. The Hooters did not exist until Summer/Late Summer 1990. “We dropped to 34th in 1989, but took 12th in the 1990 Music City Open” Again, a mistake or mix up by the writer. Paladin actually competed in the 5 man in the 1989 Line SI Masters, and we finished 34th. 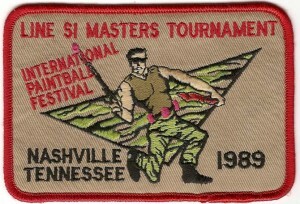 This was the first year for the 5 man competition and the first Masters. Paladin is also the team that competed in the 1990 Music City Open and finished 12th. No worries however, Jack was indeed a member of TN Grim Reapers, Paladin, and the Music City Hooters, so he had a part in all of those tournaments and games. Line SI 1991 Master Tournament Patch. Fall 1991 – I believe (although I can not say 100%) that the Music City Hooters played in the Masters, and I know Ronnie Greer, Tony White and I played in several MSPA tournaments with the Hooters. However, I did not play in the 1991 Masters with them (though I believe I may have reffed that tournament for the 10 man division). 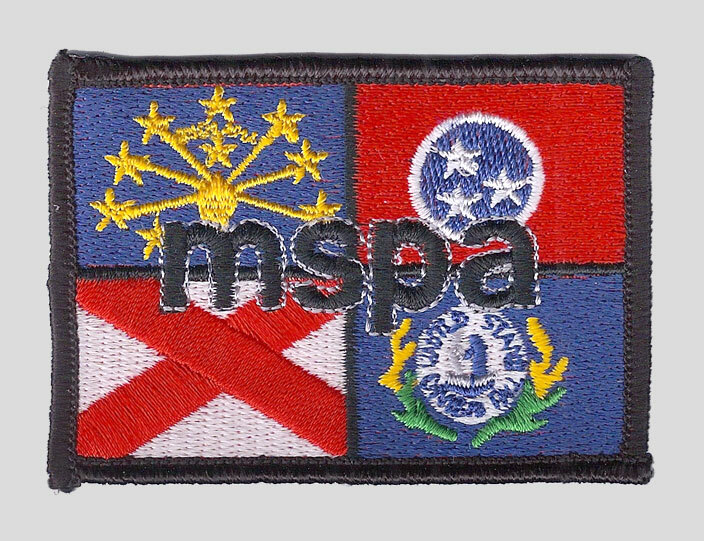 Mid South Paintball Association sticker. Probably c. mid 1990s. 1992 – Hooters continued to play MSPA tournaments here and there, with varying line ups if I remember correctly. Team Slick Fox patch c. early 90s. 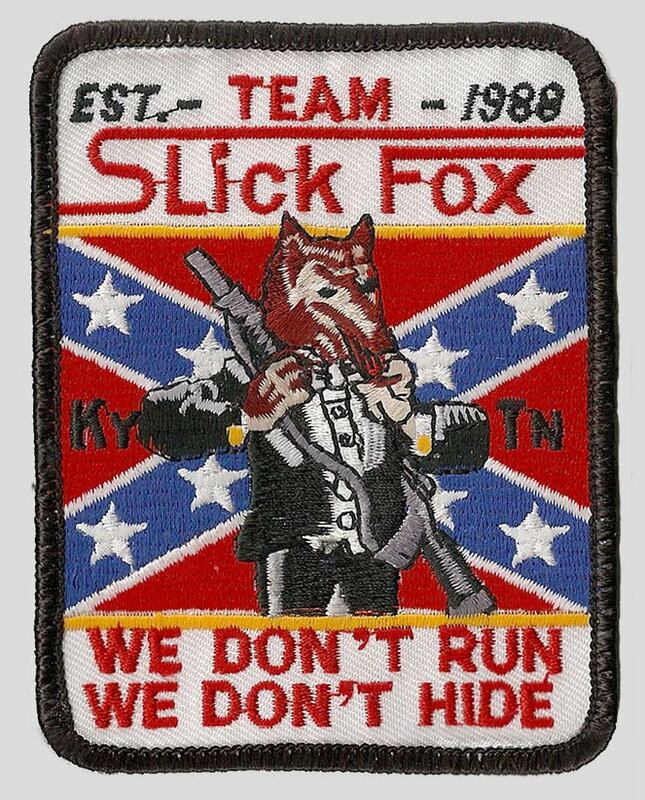 Slick Fox Adventure Field and Team Slick Fox were both run by Tad Taylor in Bowling Greens Ky. I personally took the year mostly off from tournament play, playing rec locally and reffing mostly at the larger events. It was during this year I started playing closer to home in KY….at Tad Taylor’s “Slick Fox Adventure Games”. 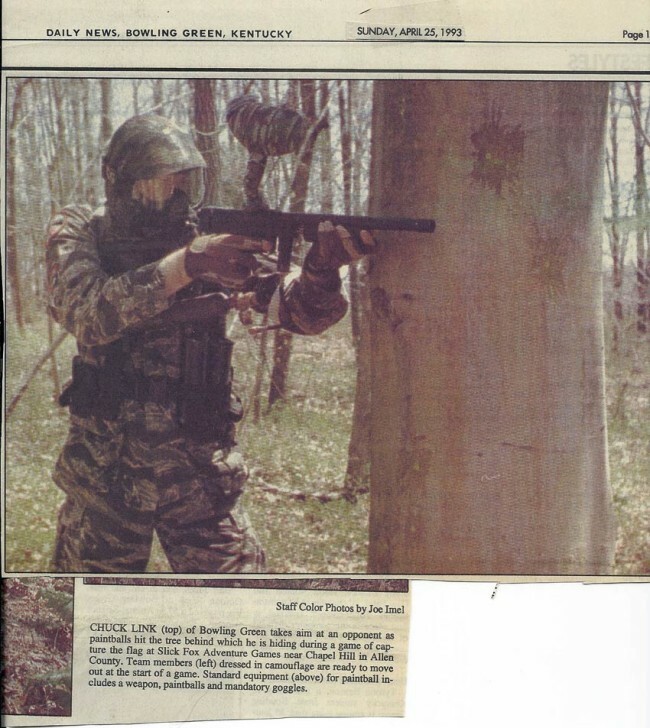 Chuck Link, with Thompson barrel Sniper 1, pictured in the Daily News of Bowling Green Kentucky. Paper scan is from dates April 25th, 1993. This eventually led to Tad asking me to join his team, “Slick Fox”, and to form a second 5 man squad that I would captain and compete on the 1993 MSPA full schedule. This second team was called “Slick Fox Raiders” (I added the Raiders name after my favorite football team, the Oakland Raiders. An MSPA tournament is featured on WBKO 13 Kentucky. Tad Taylor of Slick Fox Adventure Games and Chip Herbert of the Nashville Ridgerunners are interviewed. Date is somewhere between 1992 and 1995 (likely 1993-95). Chuck crouched down at Slick Fox Adventure. 1993– Hooters played MSPA tournaments here and there, and I captained the Slick Fox Raiders team made up mostly of new and in-experienced players. We all reffed numerous tournaments together though and Jack and I remained friends though we did not get to see each other as often as when we played on the same team. Jack Kirby was tragically killed in an Automobile accident on April 9th, 1994. 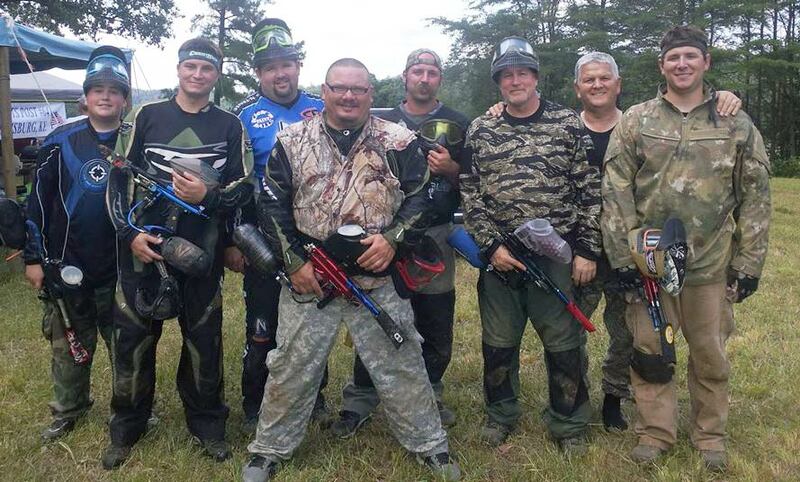 Scanned from the Mid South Paintball Association Newsletter about Kirby’s memorial service. Scans courtesy Chuck Link. 1994 – In April of 1994 Jack was tragically killed in the auto accident, ending the Music City Hooters run. What became of all the other guys I’m not sure, though I have recently been in contact with Chris “CJ” Christians. He may remember more than I. 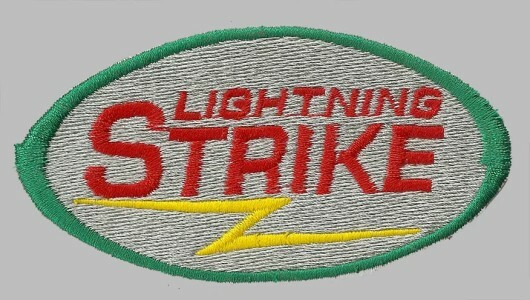 Team Lightning Strike patch. c. late 1990s. 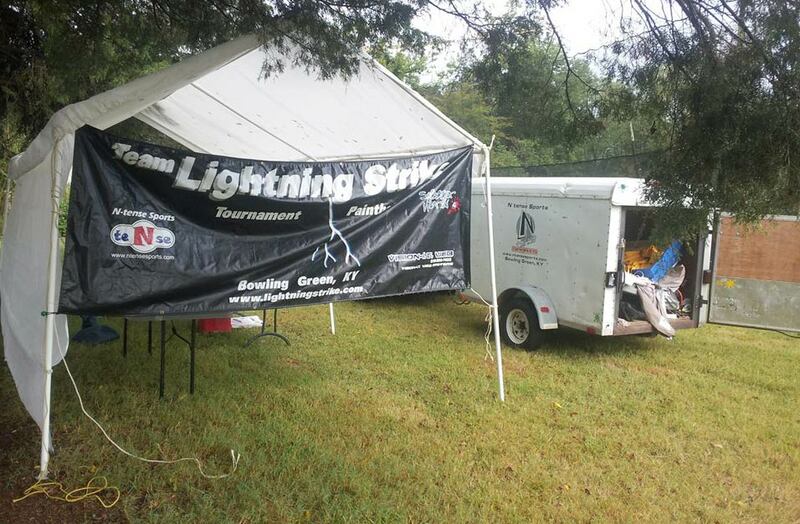 In 1994, we had established, once again a player base in our hometown of Bowling Green, Kentucky with enough guys serious about playing tournaments that I, Brian Ray, and Jeff Mouser founded Team Lightning Strike. 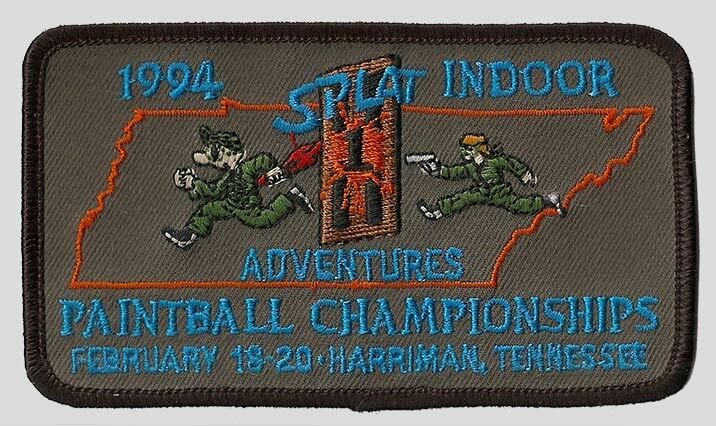 Splat 1 Indoor Adventures patch for the 1994 Paintball Championships. Team Lightning Strike was primarily aimed at competing in MSPA 5-man events, though we would play the Masters, Music City Open, National Indoor, Columbus Cup Indoor, and many other tournaments over our 10 year run. Lightning Strike team photo. c. 2000? 1995- to 2004 – Lightning Strike team photo above with banner is from the last tourney I played, in February of 2002. It was a 5 man that was held on the campus of Ole Miss (University of Mississippi). This was the LS “Red” Squad….with Jeff Mouser and I being the “old guys” playing with 3 rookies in the Novice division, we finished 3rd. 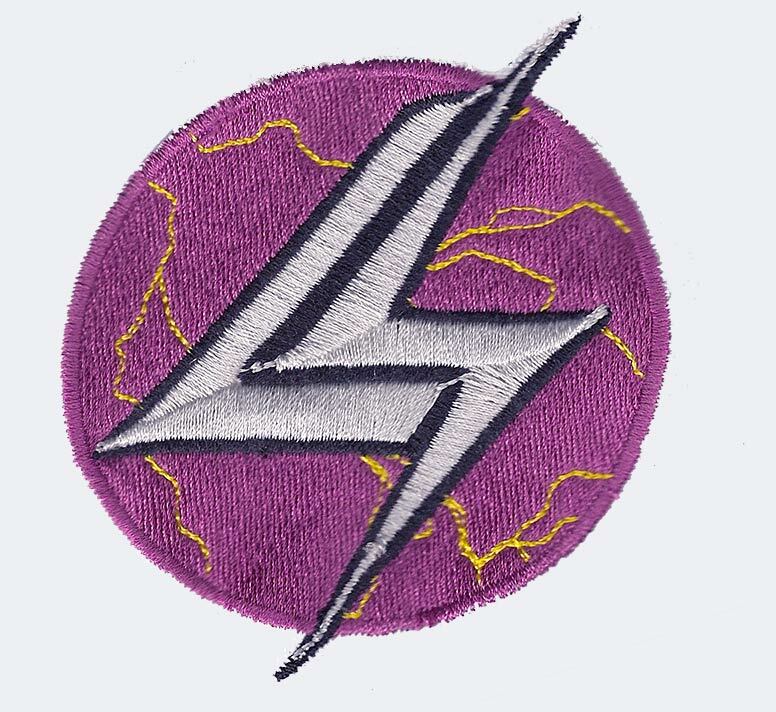 2 years after I retired in 2002, the Lightning Strike name was retired in 2004 and changed to “Team N-tense” to promote the field and store in Bowling Green, KY (that still exists). N-tense Sports was the biggest team sponsor and was owned by a team member, Brent Sanford and when I retired I turned the team over. 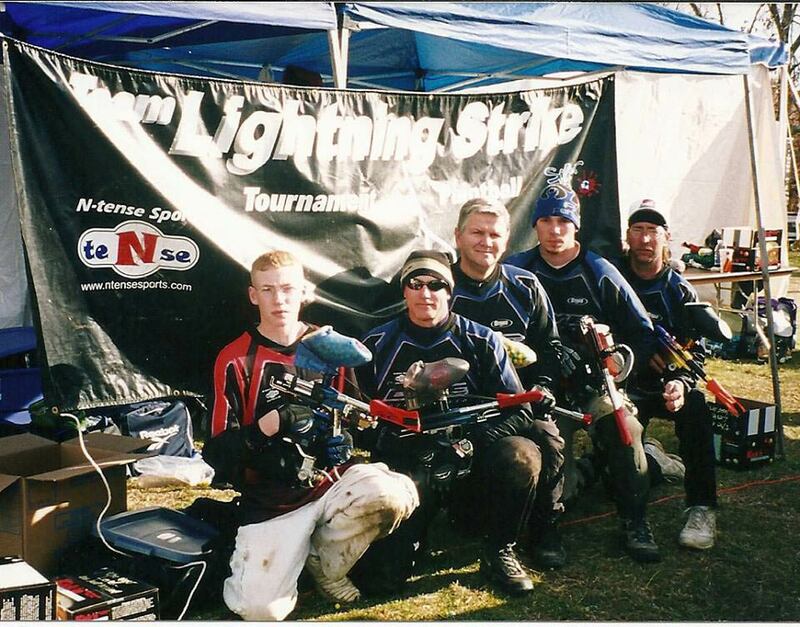 Team N-tense or “N-tense Sports” continues to this day and regularly competes in SEPS (South Eastern Paintball Series) events as well as World Cup a few times, and other national and regional events. 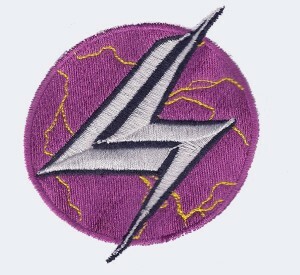 July 2014 to present – As of July/August 2014, Lightning Strike team members have reconnected and started playing again. Chuck (3rd from right wearing tiger stripe jersey) and Lightning Strike reunite at a local charity game on July 20th 2014. Above is a group photo of some of my old Lightning Strike teammates and I from the benefit game we attended on July 20th. Lightning Strike friends and families met up in early August for a 20 year reunion. 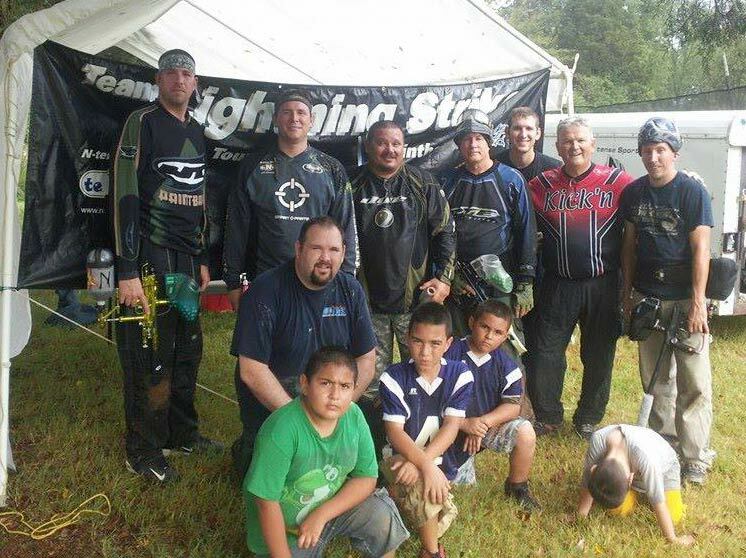 Latest on the paintball “revival,” two weeks ago (August 2014) we had a 20 year reunion for our Lightning Strike paintball team. Met at our local field, N-tense Sports in Bowling Green, KY. Some of us even played a few games. Didn’t have a huge turn out ( I estimate we had over 50 players go through our roster over the 10 year period from the team’s founding in 1994 until it disbanded/changed names in 2004. Above is a photo from the reunion. We had probably had 6 or 8 playing and the rest were former players kids, family, etc. Brent Sanford, owner of N-tense Sports, former LS (Lightning Strike) member, and captain after I retired in 2002 still had our old LS banner. You can see in the background, it is still in great shape. Old Lightning Strike shirts, photos and memorabilia hanging at the LS 20 year reunion. I asked everyone to bring old photos, t shirts, and jerseys if they had them, and we had a few that you see hanging up. Over the years I’ve owned and used, in order: WGP Bud Orr Sniper I, Jack Kirby Custom Helix long barrel pump, VM-68, 68 Automag (1st gen), MiniMag, Bob Long Defiant (1st Gen), WGP Black Magic Autococker (2001-2). Still have the Sniper I and now have a 2001-2 WGP Black Magic Autococker again. All photos courtesy Chuck Link, most patches originated with Chuck as well and were passed on to BacciPaintball. Scans courtesy original publications. If you find inaccuracies/corrections or know names of players in photos please comment below!